If you’ve been to Case Western Reserve University in the past year, you might have met Hacker Society- the computing student interest group on campus. I attended my first meeting the fall of my sophomore year when I switched out of the Biomedical Engineering department and into Computer Science. There were a few familiar faces in the room that I’d met briefly through my boyfriend’s fraternity, but other than that, I was a fish out of water. A few minutes into my first meeting, however, I was surprised to find they were very welcoming. That’s all it took. From there on out, I attended the Wednesday night tech talks as often as I could, even when they were way over my head. Over the next few years, I was either the lone woman at each meeting, or one of only a handful. Sitting around at the campus bar after Hacker Society one night (one of only two women in attendance), someone made a joke that the only time I made new girl friends was when someone from Hacker Society started dating a new girlfriend. It was said as a joke, but it was also true. The more we talked, the less funny the joke became. Collectively as a group, we could not name 10 women in the EECS department. Between the four majors — Electrical Engineering, Computer Engineering, Systems Engineering, and Computer Science— we could count the number of women on our fingers, with space left over. It was a wake-up call for the group, but me in particular. I read about women in tech all the time. I knew the stats. I’d heard the stories. But I’d been fortunate enough to have never been on the outside looking in of this particular group. I hadn’t considered what other women might perceive as barriers to entry to this incredible club that was responsible for making me a better student and a better programmer. It was the first night that I realized I might have been part of the problem. I committed to doing something about it. There is a saying in my family that is used to dismiss excuses. Growing up, if my motivation towards reaching a goal ever dwindled, my Dad’s go-to advice was always: “You gotta want it.” I wanted this change in Hacker Society, so when Hacker Society decided to add a Public Relations chair as part of their leadership team, I went for it. I was suddenly the only woman on Hacker Society leadership; if anyone was going to tackle flipping Hacker Society’s image, it was me. I started with the data. We couldn’t name ten women, but if we had known all the women in the department, how many should we have been able to name? According to CWRU’s Institutional Research, the Electrical Engineering and Computer Science department (which includes Systems Engineering and Computer Engineering) had 43 women in the department total, with 24 of them declared Computer Science majors as of the end of the Fall 2013 semester. Why could we only name eight? For Grace Hopper’s sake, how did I not know the other women in my classes? It was easy to begin with looking at role models. 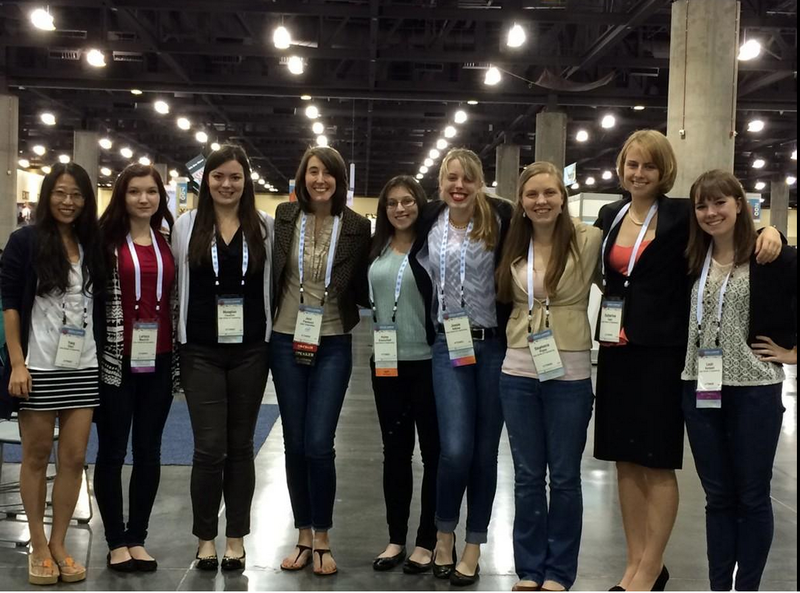 It’s no secret that women role models in the CWRU EECS department are few and far between. You won’t meet the one woman Computer Science professor who does teach an undergraduate course until your junior year, which doesn’t help discouraged freshmen or sophomore women who might not even know she exists. If I was going to tackle the role model problem, I needed to make sure the few women we did have got to meet other women in computing. Over the summer, a woman from CWRU’s Division of Engineering Leadership and Professional Practice emailed me an article about Harvey Mudd boosting their number of women STEM graduates. She followed up with asking what CWRU did to support women in computing. After I admitted there really wasn’t much offered, she encouraged me to ask for funding to attend the Grace Hopper Conference later that year. I was spending the spring and summer semester on Co-Op, and our new department head was visiting my work site with the program director (who I happen to work for during the school year). I prepared like crazy to tell him why we needed to send women to Grace Hopper. I printed the data, the Harvey Mudd article, and more or less outlined a speech to convince him to fund it. It turned out I didn’t need any of it. Dr. Loparo agreed to the trip without hesitation. The department would pay for everything but flights, as they were non-refundable if a woman dropped out. This later turned out to be a good call. I spent the rest of the summer trying to round up women through Facebook and the Hacker Society email list to attend the conference. Over the course of a couple weeks, I managed to fill up the 8 spots we had available. After booking the registrations, I met with all the women I had recruited, including another woman in the department who had registered independently of us but that the department had still agreed to fund. A lot of them were nervous about the cost of the flight. The last thing I wanted was for money to stand in someone’s way, so I committed to raising the rest of the money for flight reimbursements. I had no plan, but I agreed on the spot to find nearly $4,000 somewhere. For the rest of the summer, I spent a large chunk of my evenings on the Facebook group for incoming CWRU freshmen, answering their questions and concerns about starting college and occasionally plugging Hacker Society. I advertised how we had weekly talks. I talked about how we were starting something new this year called Open Hacks where people could just come, learn, and work on a personal project in the student lounge with us for a few hours. I shared what hackathons were and why they should consider going. Eventually, I earned their trust, and when the new freshmen arrived to campus in the fall, I started to get emails from some of the freshmen women. Naïvely, I assumed other members of Hacker Society leadership were getting these kinds of messages too, but the women were just choosing to email me. When I brought it up at a leadership meeting, I learned no one had received any such message, from a male or female student. I was the only one receiving messages from women who were worried about being embarrassed by their lack of experience. I managed to convince most of the women that Hacker Society was the best way to build experience, and that they should come hang out with us. Their messages had proved that I wasn’t making the problem up: a reason women weren’t coming to Hacker Society was due to intimidation. I was convinced that the Grace Hopper trip and a new approach to our talks could change that. Later that fall, I presented to the Case Alumni Association alongside Hacker Society’s President, David Jannotta. (I’m somewhat ashamed to admit I wanted Dave to come along because I knew I would be presenting to a board of older men who may or may not take me seriously, but that’s a story for another time.) They ended up granting Hacker Society $2100, half of which we applied to the trip costs. The rest was budgeted for new hardware and hackathon travel expenses. In addition to the CAA money, Hacker Society had some money left over from our first hackathon, HackCWRU, and leadership agreed to commit $1200 of it towards the Grace Hopper trip. After hearing the news, most girls were comfortable with the amount they’d have to spend out of pocket for the trip. However, I had promised them the full amount at the first meeting, and I was aware that a few of the girls weren’t in the best situation financially. I fronted the cost of another girl’s ticket with my Co-Op savings, and I kept looking for the last bit of funding. While all of the Grace Hopper planning was going on, Hacker Society leadership was spending its summer planning our third-annual Link-State Conference. In the midst of the conference planning, I looked through the line-ups of the previous two years of the conference. One woman presenter in two years. It wasn’t that prior leadership didn’t know any stellar women in the Cleveland area; they just hadn’t thought to invite them to speak. In hindsight, it was embarrassing. I saw to it that Link-State 2014 would be different by actively requesting women speakers. When I emailed the officers list that we had booked Sarah Dutkiewicz, a Cleveland tech figure who I had been following on Twitter to learn how to curate a community, it put a huge smile on my face to get an excited response from another officer about how it was a huge land for the conference. She had been there the whole time. No one had ever thought to ask her to speak at Link-State before. 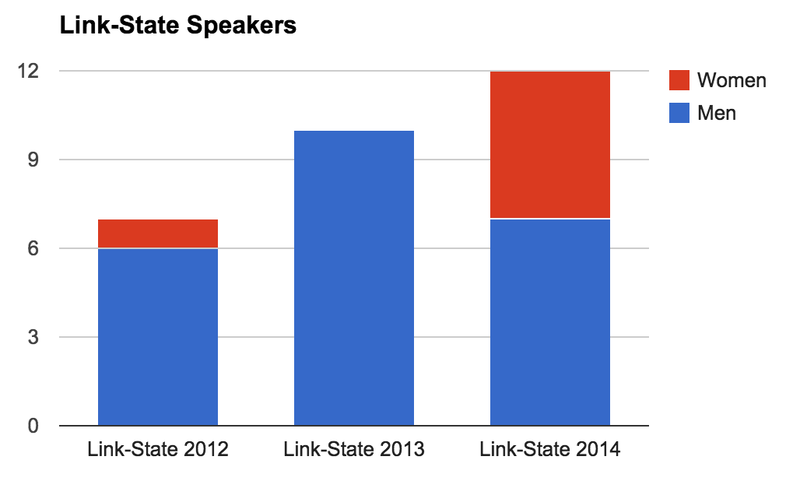 Link-State Conference Speakers over the last three years. I wish I had quantitative data to back it up, but the response to a revamped Link-State was incredible. A couple of our speakers noticed and commented to me personally. I had three underclassmen women come up and thank me (and one hug me) for bringing in speakers they identified with. People were talking about it, and it was the first real sign of progress. Shortly after, a miracle more or less fell into my lap. Two Hacker Society alumni, Brian Stack and Toby Waite, were coming back to Cleveland. Brian was coming to speak at Link-State, and Toby was due to come in for some Yelp recruiting as well as bring another Yelp engineer, Nat Thompson, for a Hacker Society weekly tech talk. At this point, Hacker Society had been making some noise on campus with its success in student turnout, and as a result of that and organizing the Grace Hopper trip, I had been invited by the Case Alumni Association to an alumni dinner “Think Tank” about how to improve the department and prepare students for the industry. We discussed everything from career support to the curriculum to the amount of women in the department. I was extremely pleased that I wasn’t even the one who had to bring the issue up. All of the alumni, which included Toby, actively discussed, weighed in, and were eager to execute the plans that were drawn up. By the end of the night, I had a promise from Brian and Toby that they would help fundraise the rest of the Grace Hopper trip by reaching out to other alumni in San Francisco. After picking my jaw up the floor, I stuttered a thank-you and when no one was looking, fist-pumped the air a few times. Sure enough, within a few weeks, the Alumni Association had opened a fundraiser online and ten alumni chipped in to cover the rest of the cost. I was floored and so, so grateful. 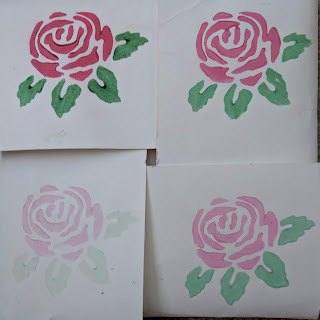 While all this was happening over the summer and into the fall semester, Hacker Society was still keeping up with the routine of Wednesday night tech talks, and I was still receiving emails from women who were skeptical about their skills. We decided to tone down the technical level of the talks for a few weeks to make beginners feel welcome. For the first few weeks of class in the fall semester, talks were centered around version control, how to use the command line, and other topics we considered basics that we would have liked to know as freshmen. I initially caught some flack for wanting to “water down” Hacker Society, but the messages I received from incoming women proved over-technical talks were intimidating barriers to entry. By the time midterms rolled around, people would describe Hacker Society as anything but “watered down.” The once-dwindling group of maybe only a dozen or so Hackers from the year prior had expanded to more than four times that. When we started scaling hacks back up, there was some drop-off in attendance, but I was impressed by the number of people who stuck around. I was ecstatic to no longer be the only woman in the room- I even ran out of room on my fingers to count them all. I had a similar euphoria when the day finally came to attend the Grace Hopper Celebration of Women in Computing. Over the course of three days, I hung out with nearly 8,000 women from around the world. The nine of us got to have lunch with CWRU alumnae, Jeni Panhorst and Tracy O’Brien, who were thrilled to finally see CWRU represented at the conference. Jeni and Tracy chatted with us about classes, preparing for interviews, and overcoming other hurdles for hours on end. We were all appreciative to hear from other CWRU graduates who had made it. Most of the women from the first CWRU GHC trip, with alum Jeni Panhorst. In addition to connecting with alumni, the CWRU women in attendance were excited for the chance they had to meet their role models, discuss new topics in computing, and just have a good time. Jessie met Bonnie Ross. Katherine and Larissa both got interviews (and later landed internships). I talked with United States CTO Megan Smith. It was an incredibly recharging three days that I could not be more grateful for being gifted. After the Grace Hopper Conference, I tried to continue to help in any way I could. I recalled how much help I’d received when I was a newly enrolled Computer Science sophomore. In particular, two men from my boyfriend’s fraternity, Sean and Beau, sat with me for hours until I got a grip on data structures. I must have asked them thousands of questions that semester, and they were the main reason I got through the class without getting discouraged. I really wanted to be the Sean and Beau to the new underclassmen who needed help. Any time an underclassmen had a question, I was going to be there as often as I could. Even now, I answer questions from all underclassmen, but the women still feel most comfortable reaching out to me. My Facebook inbox is filled with students asking last-minute questions on assignments. Several dry erase markers have died in the line of whiteboard duty. Though it takes up a lot of time, it’s been extremely satisfying answering the same data structures questions I had asked when I felt like I was pestering upperclassmen four years ago. Outside my Hacker Society responsibilities, I tried to make sure our Hacker women landed jobs for the summer, regardless of class year. If an underclassman wanted an intro, I gave it to them. If they needed a ride to an interview, I drove them. It they needed help writing a resume, setting up a GitHub page, preparing for a technical interview, or anything else, I lent a hand. It’s undoubtedly paid off. The atmosphere in the Computer Science community is much different than it was just over a year ago. Now that my reign as PR Director is up, I feel like I can walk away from Hacker Society with peace of mind that things are changing for the better. Two women, Dina Benayad-Cherif and Katherine Cass, took over my PR position, and they are already doing fantastic work. While they’re still learning just as I was, I know Hacker Society is in good hands. I have the utmost confidence that they’ll only continue to fuel the fire. CWRU still has a lot of work to do: gender certainly isn’t the only problem we have, but I like to think our department is on the right track to making changes. I’m looking forward to staying involved as an alumna when I graduate this spring, because I still have big dreams for the department. I want to see CWRU graduate an even-split CS program. I want to see Case listed as one of the Top Ten Participating Schools at a Grace Hopper Conference in the (preferably near) future. I want any student that goes into the Computer Science program with a passion to build, tinker, and hack to be empowered and encouraged to persevere through the whole program. There’s an opportunity for us to be the department we currently only dream about. You just gotta want it.